2007 started with political deadlock and ended with the same air of uncertainty that it began with. The first of January seemed to pave the way for the rest of year as the sacrifices of Eid-ul-Azha were repeated over and over again. The troubles of 2006 were never far from consciousness as the third day of the New Year brought about new problems. On January 3 the Awami League announced that they would not take part in the parliamentary elections scheduled for January 22. With the so-called grand alliance not willing to take part in the elections it put a spanner in works for the BNP. Things were fast headed downhill, and it took the nation eight days to reach the bottom of that hill. We arrived to an uncertain future on the 11th of January, a day which shaped the country and the rest of year. On January 11 emergency was declared and the man from the soil science department finally crumbled. President and Chief Advisor Iajuddin Ahmed resigned and the country was turned upside down, elections were put off and nine advisors resigned. It set the tone for the rest of the year, as former governor of Bangladesh Bank Fakhruddin Ahmed was sworn in as the new Chief Advisor, with a new cabinet of advisors and with implicit army help things were shaken up like they had never been before. Immediately "corruption" was branded public enemy number one and one by one people were caught. It was the single largest sweep against corruption this country had ever seen and its intensity did not dim with the passing of the months. It was started with great gusto as the long and accepted tradition of corruption was hounded by government and they openly stated that they would not rest till every 'big fish' was caught. Those protected by the invisible hand of political amnesty could no longer hide as the caretaker government took everyone to task. On the 18th of February they announced a list of 50 people who had 72 hours to submit wealth statements or else be picked up. It caused panic amongst the upper crust of Bangladeshi society as politicians and businessmen were all targeted. The decades of corruption, which became engrained in Bangladeshi society, were being tackled and the government proved to be unbelievably popular with the average citizen. This was the height of the government's popularity, and it did not last long, even though their unabashed war on corruption continued. From high profile arrests to price spirals, 2007 was a dizzying year. The war on corruption spared no one and now the list of people caught, positively boggles the mind, Sheikh Hasina, Khaleda Zia, Tareque and Arafat Rahman, Mosaddeque Ali Falu, Salman F. Rahman, Lutfuzzaman Babar, M.A Jalil and many more. Along the way as our nation was cleansed there were many interesting sights to be seen. From the middle of January onwards there seemed to be an abrupt decline in the number of luxury cars on the roads, from every other car in the Gulshan, Banani and Baridhara area being a brand new top end car, an attempt to conceal their wealth. The most public and ostentatious display of their wealth, the cars costing well into the crores were put under dust covers and locked away in secret garages. If only it helped ease the chronic traffic problems around the country, but seemingly it only went to prove that everyone with an expensive car to hide had more than a few other cars to troll the city with. The anti-corruption drive also brought about scenes straight out of a Gerald Durrell novel as wild animals were found in the most unusual places. It was a story of our politicians and other animals, as they set about amassing untold sums of money they also become nature enthusiasts. So much so that many of them illegally procured everything from pythons to crocodiles to peacocks and as soon as the drive against corruption was announced they dumped their furry (or cold-blooded) friends wherever they could, in a last ditch effort to save themselves from further punishment. There were crocodiles in Old Dhaka, pythons on the highways of Chittagong, deer almost everywhere sprinkled with the occasional peacock. When the corrupt were smoked out, so were their exotic pets. The long road to recovery was strewn with debris, as Rajuk and the Dhaka City Corporation (DCC) were finally backed by a government that had the will to take action. Buildings, which encroached on public land around the city, were demolished and along the way yet more high flyers were brought down to earth. People with money and power were left in the dust of their demolished buildings, but they were not the only ones to suffer. Slums and street vendors around the city were also evicted and for the longest time they had nowhere to go. They were left hopeless and jobless, but for the government as long as they were evicted they had done their job. It was a human rights disaster, eventually holiday markets were set up for the hawkers but that was nowhere near enough for them to get by on, specially with the way prices were spiralling. The demolition drive continued throughout the year and so did the saga of Rangs Bhaban. The legal tussle over the building finally went the way of the state and the building was cleared to be demolished and the overbearing monstrosity of corruption was to be pulled down. If only things had been that easy, during the demolition process six floors collapsed and killed over 10 people, seemingly the building never stopped ruining peoples lives, even as it was being dismantled. While it may seem like there was little to cheer about, our boys in green did us proud with a remarkable performance in the World Cup. Bangladesh were already drawn in a tough group but with morale boosting wins in the warm up matches they were in with a chance to pull off a major upset. And on the 17th of March it happened, Bangladesh took on mighty India and came out on top in a crucial World Cup encounter. Winning the toss and batting first India were stifled by a probing Bangladeshi attack and were restricted to 191 before being bowled out. Bangladesh attacked the score from the very first ball as the little known Tamim Iqbal took the attack to the Indians. Through a mix of bravery and youthful exuberance Bangladesh overcame the score with time and wickets to spare, with it they put themselves in prime position to make the second round, which they duly did with a facile win over Bermuda. Our cup of joy ended on a sour note as we were taken to the cleaners by the unheard of Irish. 2007 was another up and down year for Bangladeshi cricket, the World Cup was followed by a reasonably close series against India and then we were put to shame as we capitulated in Sri Lanka and were duly thrashed in every match we played. It was also a year of transition as Habibul Bashar and Dav Whatmore left their respective posts and were replaced with Mohammad Ashraful and Jamie Siddons respectively. Topsy turvy transition, in cricket and almost every other sphere of Bangladeshi society. Civil unrest at Dhaka University and a building built on a foundation of corruption were two of the biggest news stories of the year. Julius Caesar was told to beware the ides of March and before the end of the month it could be said that a mini, rural and extremist version of Caesar by the name of Bangla Bhai would also rue that statement. On the 29th of March six top militants including Jama'atul Mujahideen Bangladesh (JMB) supremo Abdur Rahman and his deputy Bangla Bhai were executed. Abdur Rahman was hanged at Comilla jail while Bangla Bhai, Abdul Awal and Rahman's son-in-law, at Mymensingh jail. The outfit's military commander and Rahman's youngest brother Ataur Rahman Sunny and suicide bomber Iftekhar Hasan Mamun were executed at Kashimpur jail in Gazipur while another Shura member Khaled Saifullah was hanged at Pabna jail. Finally a stance was taken against Islamic extremism and it was a laudable one too. requested ancient Bangladeshi artefacts be shipped to the Musee Guimet for a six-month long show. Seemingly not every offer is as sweet as it seems, and civil society members were outraged that the artefacts would be sent to France and claimed that there was no guarantee that they would ever be returned. Finally the sending of the archaeological treasures was blocked by the authorities as good sense prevailed. Then the story took a turn for the worse as the upper court vacated the lawsuit that bound the treasures to Bangladesh paving the way for them to be taken to France. The first shipment of artefacts was sent off in the face of national protests. The second shipment of artefacts was to be shipped off on Eid day (December 21) amidst even more protests and what ensued was a farce of the highest order. 13 crates were packed and sent to the airport to be shipped to France, when right before they boarded the plane a head count was done. Lo and behold they found only 12 crates as one could not be accounted for. In the process of bringing them to the airport one was lost and an empty crate was found near the airport. It was slapstick comedy of the highest order as we lost our treasures even before we had sent them. The first week of June signalled the announcement of the budget and amidst the deluge of non stop rain for over eight hours the budgets was announced on the 7th of June by a caretaker government for the fist time ever. It sent out mixed messages and in the end the average citizen was the person who suffered the most. This was not the year to be a consumer in Bangladesh, it was highlighted by formalin in overpriced food. The price spirals were out of control this year as everything became tougher and more expensive to buy. 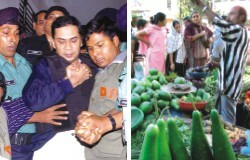 Food security still proves to be an important yet underrated topic in Bangladesh. The prices seemingly never came down this year with essentials so expensive that the government tried to provide fair price shops to ease the burden. While it was a worthwhile effort, it did not help nearly as many people as it wanted. The more the corrupt got caught the higher the prices spiralled; it was ironic and yet tragic. The prices of essentials did not ease up even through the second half of the year and the floods had a large role to play in that problem. From the end of June right through to the end of August the floods played havoc with millions of peoples lives and livelihoods, but floods hardly ever come without notice and as a nation we should have been better prepared. They remain inevitable and therefore are preventable, yet this year again millions suffered and hundreds died due to the collective apathy of a nation. Natural disasters are part and parcel of our existence but this year a man made land slide caused by unscrupulous hill cutting left close to a hundred dead in Chittagong. On the 11th of June a land slide caused by the heaviest rains in 25 years and years of treacherous hill cutting extinguished the lives of over 80 people in an all too escapable tragedy. In the year of the IPCC and Al Gore environmental issues played a big role in the shaping of our lives. The floods wiped out farms and their harvests as well as waterlogged Dhaka to a state of biblical proportions. From the farmers to the city slickers to the people who struggle to make ends meet, the floods played a role in everybody's misery. Past the middle of the year the issue of migrant workers also become a national topic of interest as hundreds and thousands of them sold everything they had in the search for a better life abroad. That itself was not the topic of discussions or interest, but the phoney companies that swindled them out of lakhs and sent them abroad without so much as a proper visa certainly were. This year seemed to be a bumper year for fakes as labour agencies took thousands of peoples' life savings, promising them jobs abroad and in the end left them high and dry often without jobs, and often even without proper documentation. From Malaysia to the Middle East Bangladeshis were stranded in airports around the world, having left everything they owned and loved behind, they were cheated by the people who they trusted with their futures. he along with three others were senselessly beaten and one can guess what happened after that. It was nothing short of a pitched battle, sparked protests and aggression around the country. So much so that curfew was called and after 6 P.M all cell phone operators were forced to turn off their services as demanded by the government. Eventually the army left the premises of DU and even apologised for the initial incident. This should have ended the episode. Regrettably, the next day saw violence spread in many parts of Dhaka, destruction of public property, damaging hundreds of cars and shops, that led to further deterioration of the situation. Several DU and RU teachers and hundreds of students were arrested. Some RU teachers have later been released. However, DU teachers and students remain in confinement. The year was not without its positives, and the people who showed the greatest spirit were those who had been through the most, and had overcome every insurmountable obstacle. From the 2nd to the 11th of October the Special Olympics took place in China and a team of 47 participants from Bangladesh proved that they were the true torchbearers of the nation. Their success was unprecedented as they came back with 71 medals. The athletes participated in seven categories aquatics, athletics, badminton, bocce, football, table tennis and cricket. They went on to win 32 Gold, 15 Silver and 24 Bronze medals, a haul essentially made them the most successful Bangladesh team to ever participate in a sporting event. In what proved to be a tough year for Bangladesh they brought smiles to the faces of millions. They are truly special, and their inspiration was nothing short of exceptional. The social ailments of a nation were also played across the front pages of its newspapers as a drug named Yaba become the talk of the town. On the 18th of October 6 youths of 'well to do' families were arrested in possession of the drug. In Dhaka and elsewhere across the nation drugs had long been a problem with the youth, it was something that was not thought of in the upper echelons of society, but with a few simple arrests the real problem of drug usage amongst the rich was thrown wide open. There were raids almost every week and little by little the problem was brought to light. Rich kids with money to spare and without a thought in the world found all the answers they craved in drugs such as Yaba and heroin and what was thought to be a lower class ailment turned out to be more of a problem for the rich and successful. The stories of the Yaba children, men and women were played out on the front pages of newspapers and it was nothing short of a tabloid media event as their personal lives became fodder to fill up column inches. October proved to be an interesting month. On October 25 Jamaat-e-Islami Secretary General Ali Ahsan Mohammad Mujahid made a few statements he now surely wishes that he didn't. He told the media that Jamaat did not work against the Liberation War in 1971 and there are no war criminals in the country. It was scandalous to say the least and did his party no favours as the nation finally turned on them completely. Since the so-called cleansing process started there have been renewed calls for all the participants of the next elections to be corruption free, that has also come hand in had with a new call to try the war criminals of '71. The statement also reiterated by Shah Abdul Hannan the following day on a live television show. Around the country there was a rebirth of nationalism, people were again proud to be patriotic and finally the nation put its foot down to say, we shall never forget the atrocities of '71, try the war criminals now! November 1 will be a date remembered for all the right reasons as finally the judiciary was separated from the executive. The chief advisor inaugurated the Dhaka District Judicial Magistracy and Dhaka Metropolitan Magistracy and went on to say that the day will serve as a "glorious milestone" for advancing the rule of law in the country. He was quite honest in his opinion when he said if the judiciary is subservient to the executive, it will be distracted from justice and more concerned with the wishes of 'certain authorities'. It was a point well made and more than a step in the right direction as a start stop year politically finally seemed to gain some much needed ground. Climate Change was never far from anyone's lips as this year Bangladesh went through a sever summer, crippling monsoon and biting winter, in between we even managed to fit in a cyclone of epic proportions. On the 15th of November a cyclone named SIDR hit the south of Bangladesh and rearranged everything in its path. It was the most powerful storm to hit in decades and within a few hours did its damage. With a huge tidal surge it hit the coast hard washing away people and their dreams. Within hours electricity was knocked out around the country as the national grid fell and while the south of the country was being battered the rest of the country was in total darkness. When the winds died down and waters receded the true force and effect of the cyclone was visible for the first time, the Sunderbans were devastated with just under half of the forest destroyed. But that was the least of our worries as the eventual death toll reached well over 3000 with countless others still missing. One million homes were destroyed and the winter harvest was totally destroyed, having just got over the floods we could least afford this natural calamity. This year was one we shall not soon forget, three Eid's in one year and very little to cheer about. It is ironic that the year started with sacrifice and ended with it, from personal sacrifices to national ones. One hopes this year of trials and tribulations will stand us in good stead for many years to come. Positives have come out of it, we are on the long road to reform, but elections still seem quite distant. People have rallied against war criminals yet we wait for assertive action, the nation has suffered the debilitating effects of climate change and yet we still wait for the world to care. This year a Nobel laureate entered and left politics before he sullied himself in its dirty business and the IMF and World Bank again put the shackles on the country as we remain tied to their every whim and fancy. Electricity became a national issue after decades of governmental incompetence, the gap between demand and supply reached 2000 mega watts as all shops were forced to close early to save power. Muggings and crime were on the up in the capital, no matter what the government says to the contrary. And our proud Tigers had yet another up and down year, much like the 150 million who support them. Here's to next year, may it be as chaotic as the last, but as long as some progress is made perhaps no one will complain.